In continuation to part 1 and part 2 of this blog series… NRPE (Nagios Remote Plugin Executor) is yet another Client/Server plugin for Nagios (but can work with other applications too). Unlike NRDP, Nagios isn’t required for NRPE to function which means you can harness the power of this tool and apply it to many other applications too. It does however work ‘very’ well with Nagios and was originally designed for it. If you read my blog on the NRDP protocol, then you’re already familiar with it’s push architecture where the Applications are responsible for reporting in their status. NRPE however works in the reverse fashion; NRPE requires you to pull the information from the Application Server instead. The status checking responsibility falls on the Nagios Server (instead of the Applications it monitors). The diagram above illustrates how the paradigm works. The A represents the Application Server. There is no limit to the number of these guys. The N represents the Nagios Server. You’ll only ever need one Nagios server. The Nagios Server will make periodic status checks to the to the Application Server via the NRPE Client (check_nrpe). The Application Server will analyze the request it received and perform the status check (locally). When the check completes, it will pass the results back to the Nagios Server (via the same connection the NRPE Client started). Nagios will take the check_nrpe results and display it accordingly. If the check_nrpe tool can’t establish a connection to the NRPE Server (running on the Application Server), then it will report a failure. If the call to the check_nrpe tool takes to long to get a response (or a result) back, then it will be reported as a (timeout) failure. By default check_nrpe will wait up to a maximum of 10 seconds before it times out and gives up. You can change this if you find it too short (or to long). Note: You will need this installed in order to monitor applications with NRPE. See part 1 of this blog series for more information if you don’t already have it set up. I forwarded the useful patches from the old NRPE v2.x branch to the new NRPE 3.x branch that were applicable still. I patched the SystemD startup script to work with CentOS/Red Hat systems. A sudoer’s file is already to go for those who want to use sudo with their NRPE remote calls. There is firewall configuration all ready to use with FirewallD. For those who really don’t care and want to just jump right in with the product. Here you go! el7.rpm The NRPE Server: This should be installed on any server you want to monitor. The server will allow the machine to respond to requests sent to it via the check_nrpe (Nagios) plugin. el7.rpm An SELinux add-on package that allows the NRDP Server to operate under Enforcing Mode. Note: This RPM is not required by the NRDP server to run correctly. el7.rpm Our NRPE Client; this is the Nagios Plugin used to request information from the NRPE Server(s). You’ll only need to install this on the Nagios server (for the purpose of this blog). The RPM provides a small tool called check_nrpe that gets installed into the Nagios Plugin Directory (/usr/lib64/nagios/plugins). Through some simple configuration; Nagios can use the check_nrpe tool to monitoring anything you want just as long as the NRPE server is (installed and) running at the other end. The NRPE Server is usually installed onto all of the Application servers you want Nagios to monitor remotely. It provides a means of accepting requests to process (such as, what is your system load like?) and handling the request and returning the response back. allowed_hosts This is added security for NRPE but can come back and haunt you if you ignore it (as nothing will work). You should specify the IP address of your Nagios server here and not allow anyone else! For example, if your Nagios server was 6.7.8.9, then you would put 6.7.8.9/32 here. dont_blame_nrpe This allows you to pass options into your remote checks. I personally think this is awesome, but there is no question that depending on the checks that accept arguments, it could could exploit content from your system you wouldn’t have otherwise wanted to share. This is specially the case if you grant NRPE Sudoers permission (discussed a bit lower). Set this value to one (1) to enable argument passing and zero (0) to disable it. allow_bash_command_substitution Bash substitution is something like $(hostname) (which might return something like node01.myserver). Set this value to one (1) to enable argument passing and zero (0) to disable it. I don’t use personally use this and therefore have it disabled on my system. Substitute User Do (or sudo) allows you to run commands as other users. Most commonly people use sudo to elevate there permission to the root (superuser) privilege to execute a command. When the command has completed, they return back to their normal privileges. The client side simply consists of a small application (called check_nrpe) which connects remotely to any NRPE Server you tell it to and hands it a token for processing (provided your NRPE Server is configured correctly). The NRPE Server will take this token and execute a command that was associated with it and return the results back to you. ; first we define a host that we want to monitor. # everything checks out okay! Which one should you use? Both NRDP and NRPE have their Pro’s and Cons. You have central control over the checking periods of an application. You only ever need to open 1 TCP port; from a security standpoint; this is awesome! You don’t need Nagios to use this. If used properly, it can provide a great way to access remote servers for information and even execute administrative and maintenance commands. You only need to manage the Nagios configuration when a new server is added. Can send multiple status messages in one single (TCP) transaction. Can reflect a remote application status change immediately oppose to NRPE which one reflect the change until the next status check is performed. It should be worth noting that nothing is stopping you from using both NRDP and NRPE at the same time. You might choose an NRDP strategy for remote systems while choosing an NRPE strategy for all your systems residing in your private network. NRPE works over the internet as well, but just exercise caution and be sure to have SELinux running in Enforcing mode on all of the server end points. This blog took me a very (,very) long time to put together and test! The repository hosting alone accommodates all my blog entries up to this date. All of the custom packaging described here was done by me personally. I took the open source available to me and rebuilt it to make it an easier solution and decided to share it. If you like what you see and wish to copy and paste this HOWTO, please reference back to this blog post at the very least. It’s really all I ask. Nagios Core 4.x Setup for CentOS 7.x: Part 1 of this blog series. NRDP for Nagios Core on CentOS 7.x: Part 2 of this blog series. Nagios Exchange: Specifically the link about NRPE. This entry was posted in Linux HOWTO, Missing Linux Packages and tagged Centos, epel, Monitoring, Nagios, Nagios Core, NRPE, Red Hat, RHEL, RPM on November 29, 2016 by l2g. In continuation to part 1 of this blog series… NRDP (Nagios Remote Data Processor) is a Client/Server plugin for Nagios. With the NRDP model, it is the Application (or the server hosting it) that is responsible for reporting in it’s status. The beauty of this is you can have applications installed all throughout your business, your home, across data centers, overseas, etc all reporting to 1 single Nagios instance. You can monitor your entire infrastructure with this tool. The Application (and/or the server hosting it) will make periodic status reports to the Nagios server. It should report that everything is okay, or report that it isn’t. Out of the box (using my rpms) Nagios will wait for up to X minutes (configurable) for a message to be received before reporting the service/host as being offline. Ideally you should send at least 2 or 3 notifications within this grace period. Currently X is set to 5 minutes with the templates in the RPMs I provide. But you can change this. If Nagios doesn’t hear from the Application for an extended period of time, then it assumes the worst and reports to the user that there is a problem. NRDP is a newer chapter in the Nagios world which allows you to monitor more applications you wouldn’t have otherwise been able to do. NRDP replaces it’s predecessor NSCA which performs the exact same task/function. One of the key differences is that NRDP is much easier to set up and use than NSCA is. NRDP is also much less lines of code too! The RPMs I provide make the setup even easier. That said, if you’re interested in using NSCA instead, I still package it here (and client here). But lets get back to talking about NRDP…. Note: You will need this installed in order to use NRDP. See part 1 of this blog series for more information if you don’t already have it set up. The default insecure port is configured to use 5668. The default secure port is configured to use 5669. I included my own Apache configuration so that the service would run right out of the box. There are a several patches I had to make in order for the NRDP package to even work in our CentOS environment. el7.rpm The NRDP Server: This must be installed on the same server running Nagios. It is in charge of listening to requests sent by nrdp-clients and reporting their status directly to Nagios. Don’t forget to change your tokens which we’ll discuss further down if you don’t know what I’m talking about! el7.rpm The NRDP Client: You’ll only need to optionally install this on to the remote servers that will be sending their status along to your NRDP Server. Since the protocol is so simple to adapt, you can also just choose to build the client aspect into the program you want to monitor with. If you do choose to install this RPM, you get access to a small program called send_nrdp.php which allows you to post status messages to the Nagios Server. el7.rpm Just some documentation that is already publicly available on NRDP’s website. The NRDP Server is only going to work if it’s installed on the same server as Nagios. # to that of whatever your current system is set to! If Apache isn’t running; now’s the time to start it up. # will be running and ready to go. You need to let Nagios know what services it should expect notifications from. The key thing that separates these entries from any other Nagios entries you specified is the ‘use‘ directive. For hosts reporting in, you’ll want to use the generic-nrdp-host directive. For services reporting in, you’ll want to use the generic-nrdp-service entry. # to use the 'linux-server' template instead. # Now we might identify a component to associate with our test server called <em>somehost</em>. With the templates I provide, Nagios will wait for up to 5 minutes for a notification before assuming nothing is coming (and changing the state to CRITICAL). If this is too long (or too short) of a wait time for you, you can change it by modifying the NRDP templates (or creating your own). The provided NRDP templates can be found here: /etc/nagios/conf.d/nrdp.conf. You’ll want to focus on the entry entitled freshness_threshold which is currently set to 300 (300 seconds is equal to 5 minutes) and change it to your liking. Once NRDP is up and running it will provide you a simple website you can use to interact with it. This interface allows you to manually send passive checks through to Nagios which is really useful for testing if everything is working okay! 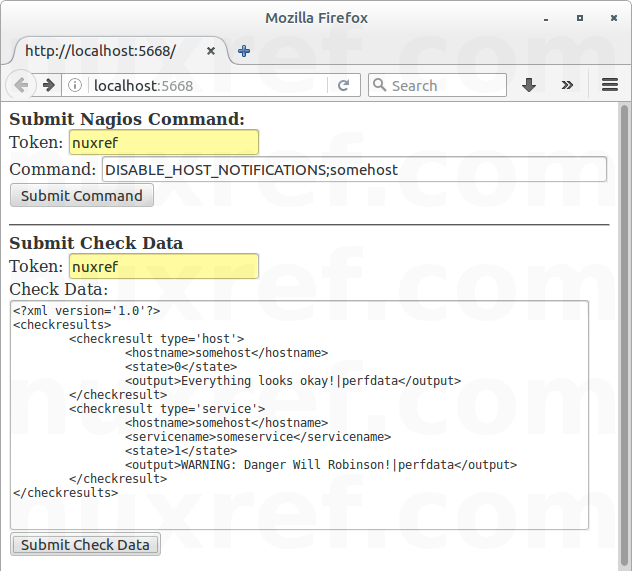 NRDP Server Side – use nuxref as a token to test with. Note: The blog does not touch on the Submit Nagios Command portion of this page; but that’s another topic for another day. You want to focus on the Submit Check Data section. To use NRDP you will be required to provide a token with every submission you ever make to it. This is just a security feature to prevent people from sending messages into your system who shouldn’t be. By default (if you’re using my rpms), the token is nuxref. You’ll notice in the above example, I’ve gone ahead and filed this field in to show you where it goes. If you followed the blog so far and created the test examples I provided (above), then you can now submit a passive check using the default settings; don’t forget to provide your token! Since you can access a very simple NRDP webpage on the same server hosting Nagios via http://localhost:5668/ (insecure) or https://localhost:5669/ (secure), you’ll want to protect it from those who shouldn’t be visiting it. Note: Again, I want to stress you should only open ports you intend to use and to the Application Servers who intend to use it. If you don’t intend on using the insecure port, then don’t even open it on your firewall! Now… from our application server we would want to install our nrdp-client package. so that we can access our send_nrdp.php tool. #        sending status requests to your Nagios server. --output="Test is is working great." Note: It’s worth noting that there are no WARNING states for hosts. A zero (0) will report that it is online, and anything else will report it as CRITICAL. Are you a developer? If you are, you may want to avoid using the script and just talk directly to the NRDP Server from your application. It’s incredibly easy to do. If you’re not, don’t worry; the send_nrdp.php script looks after all of this for you. You can still read this section if you’re interested none the less. NRDP is literally just a small PHP website that relays XML it receives via it’s restful API into a language that Nagios can interpret. In fact NRDP is just a website that writes specially formatted files into the /var/nagios/spool/checkresults/ directory to which Nagios scans for processing. Since it’s a PHP website, it’s hosted via Apache, NginX, etc. This blog sets up Apache but nothing is stopping you from using another service. This means however that all interactions are web requests. A transaction must be an URL encoded HTTP POST and it must include a special token as part of its payload (part of the verification process). If the token specified is invalid or missing, then the NRDP server will just reject the message. The same rules apply if you don’t POST the message. This blog took me a very (,very) long time to put together and test! The repository hosting alone accommodates all my blog entries up to this date. All of the custom packaging described here was done by me personally. I took the open source available to me and rebuilt it to make it an easier solution and decided to share it. nrdp-php_headerfix.patch: Fix PHP header so tool can be executed on the shell. nrdp-basic_authorized_token.patch:Default (nuxref) token for an out-of-the-box working solution. nrdp-date.timezone.warning.patch: Silence potential Timezone Warning Message. nrdp-client-support_ports.patch: Support more then just port http 80 (as this blog sets up our NRDP server using ports 5669 and/or 5668). NRPE for Nagios Core on CentOS 7.x: Part 3 of this blog series. Link to NRDP: This is the source of where NRDP originates from. Link to NRDS_win: A Microsoft Windows Client so that they can easily send their status to an NRDP Server. NRDP GitHub: This seems to have some added content that hasn’t been pushed back to Nagios Exchange. I’ve provided all of my changes identified in this blog in pull request #12. This entry was posted in Linux HOWTO, Missing Linux Packages and tagged Centos, epel, Monitoring, Nagios, Nagios Core, NRDP, NSCA, Red Hat, RHEL, RPM on November 24, 2016 by l2g.